A lanyard in case you don't want to use it on your binoculars. 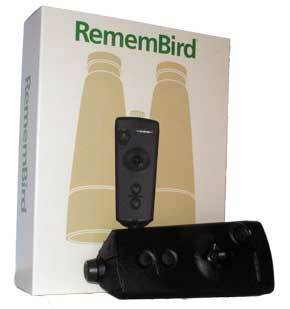 To see how RememBird works, check out the My RememBird section of the website - even if you haven't got one yet. 44.1KHz sampling, stored in MP3 format @ 64kbps. Format selectable between 32kbps and 128kbps. 5 LEDs show proportion of memory used. 0-60% shows green, 60-80% amber, 80%-100% Red. Internal speaker and 2.5mm headphone jack for standard earpiece. Adapter cable available for 3.5mm plugs. Forward facing higher gain microphone. Gain adjustable. Stereo input. 1V pk-pk maximum. We recommend high capacity batteries (1000mAh and above). Rechargeable NiMH batteries are not supported. LED flashes green (good), red and green (low), red (critical). Note: Applying self-adhesive Velcro® strips to binoculars should be considered a permanent fixing. Attempting to remove the pads may damage the surface finish of the binoculars. Approximately 50g (2 ounces) including battery.